Now it is getting exciting again: You are sending an encrypted e-mail. In this case, you will need Outlook (or another e-mail program that supports cryptography), Kleopatra and of course the public certificate of the person you are correspondign with. 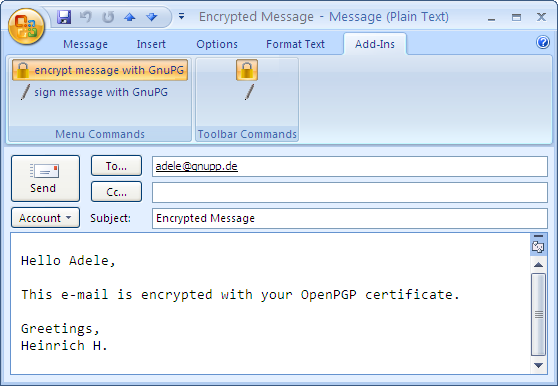 You can use Adele to practice the encryption process with OpenPGP; on the other hand, Adele does not support S/MIME. You can send the e-mail to be encrypted to adele@gnupp.de. It does not matter what your write in your message, since Adele cannot read it. First, compose a new in Outlook and address it to the person you are writing to. To send your message as in an encrypted form, select the item Extras -> Encrypt message in the menu of the message window. The button with the lock icon in the tool bar is activated - you can also click right on the lock. 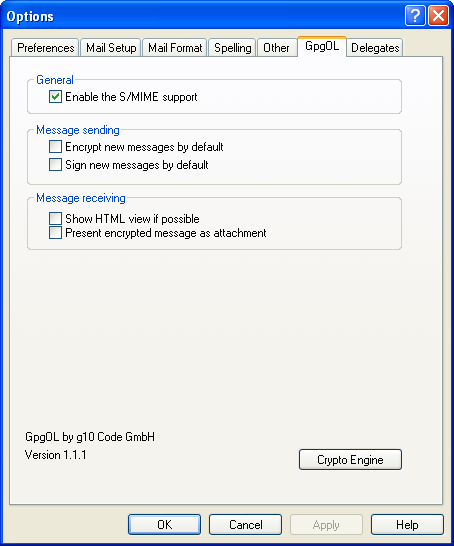 Gpg4win will automatically detect the protocol - OpenPGP or S/MIME - of the public certificate provided by the person you are corresponding with. As long as there is only one certificate that matches the recipient's e-mail address, your message will be encrypted and sent. If Kleopatra is not able to clearly determine a recipient certificate using the le-mail address, e.g. if you have an OpenPGP and S/MIME certificate from the person you are corresponding with, a selection dialog which allows you to select the right certificate will be displayed. If Kleopatra is not able to find the public certificate of the person you are corresponding with, you probably have not imported it into your certificate administration yet (see Chapter 10) or perhaps have not authenticated it yet (for OpenPGP; see Chapter 11), or have not expressed your trust in the root certificate of the certification chain (for S/MIME, see Chapter 22.7). You need the correct public certificate of your correspondence partner to encrypt your messages. You have to use someone's public certificate to send them an an encrypted e-mail. Congratulations! You have encrypted your first e-mail!